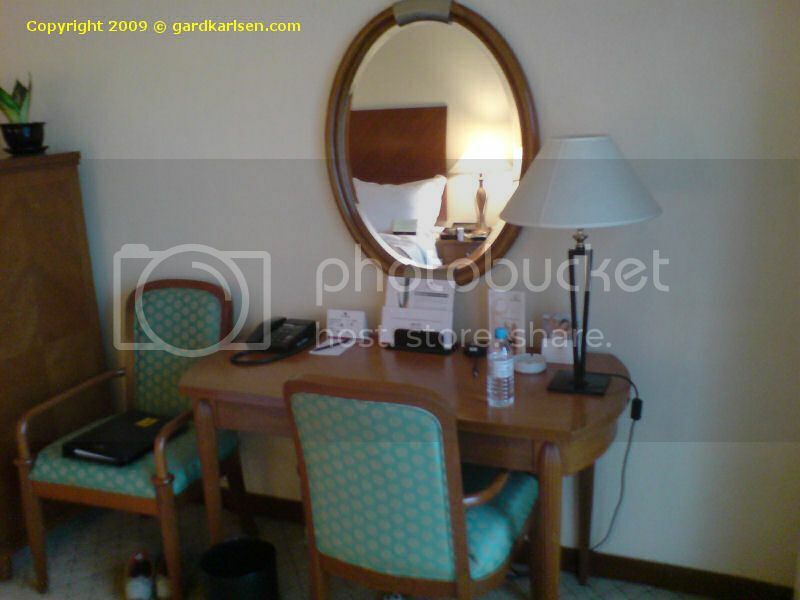 Gard’s travel blog » Blog Archive » Renaissance Kuala Lumpur Hotel – I’m not very impressed! This is a review of a stay at Renaissance Kuala Lumpur Hotel. 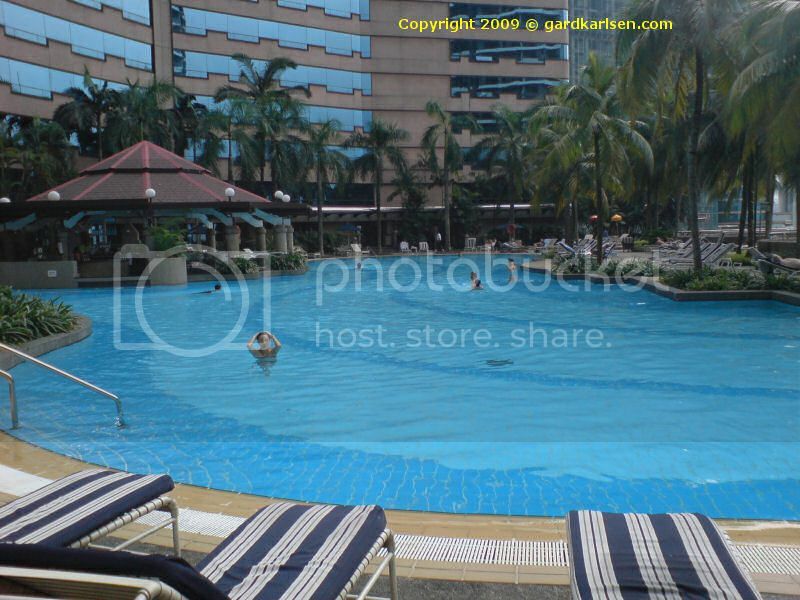 I stayed there in the end of June 2008 and I was in KL on a business trip. I have been to KL before (as you can see in this trip report with photos and links) and I have experience from various hotels such as Traders, Ascott, Federal and Agora. Click below to read the rest of this review. We booked a room through the company that we worked for in KL and we got confirmation that we had gotten rooms on the club level in the west wing. When we arrived late at night on June 21st I asked the cab driver to take us to the west wing lobby. Normally when you arrive at a 5 star hotel in this part of the world you are met by people that opens the door, helps you with the suitcase etc. This was not the case for Renaissance. We dragged our suitcases into the lavish lobby and the chandelier was enormous. When we came to the counter we were informed that we were not to be living in the west wing after all but in the East wing…so we had to drag our suitcases over to the east wing lobby…it was only a couple of minutes away. I did ask what the difference of east and west wing are and according to the staff the east wing was better. But from what I have read it seems like the west wing is the best…it is more expensive at least. When checking in it was hard to communicate with the people behind the counter as a lady was entertaining people in the bar upstairs in the lobby. I’m tone deaf and admit it…but the lady that was singing was not doing a great job in my opinion. I got room 2325 on the club level and despite the bad start I walked to the room with an open mind. I’m not sure what I expected but I was disappointed when I walked into the room. I guess I was expecting more of a 5 star hotel. The room was OK in size and it started of with tiles and the rest of the room floor was a carpet. This carpet had seen better days and there were stains here and there that looked a bit disturbing actually. The light walls also had a few scratches and marks and I got the feeling right away that it was a room that needs an upgrade. The big bed looked tempting and there were lots of huge, soft pillow. But when sitting down on the bed it felt uneven and felt like it was overdue to be replaced. The rest of the room was pretty standard: a two seat sofa with a small table, a desk for work, s small minibar (a beer was 22 ringgits), a safe, iron/ironing board etc. 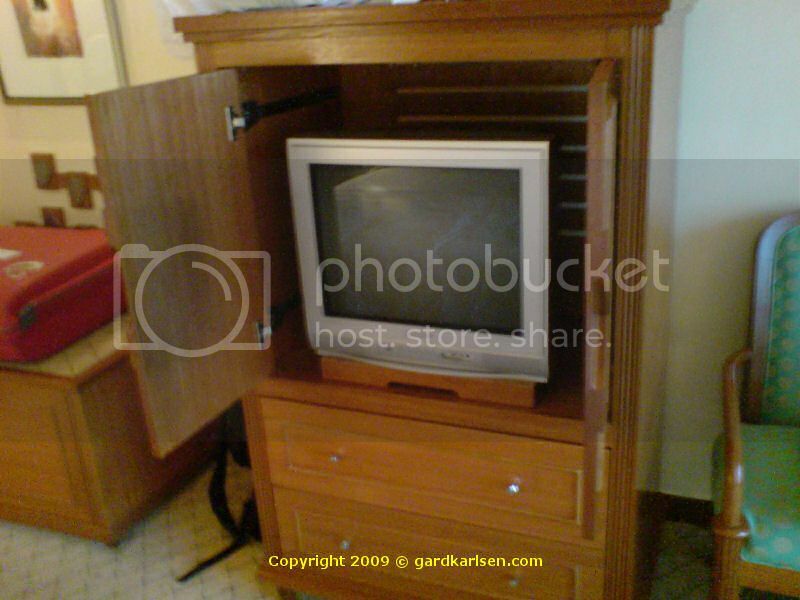 The TV was a small CRT TV (the old type TV) in an old fashioned cabinet…I don’t think I have seen this in a hotel for many years. Not very practically if you ask me. As we were on the club level I was expecting a complimentary internet connection but that proved to be wrong. First of all: the work desk did not contain a plug for the PC so in order to get some power to the PC I had to crawl under the desk and pull out one of the plugs. The hotel does not seem to have wifi but standard wire connection…and you have to pay for it. I don’t understand how hotels can use this to make money…in these days an internet connection is vital on a business trip. 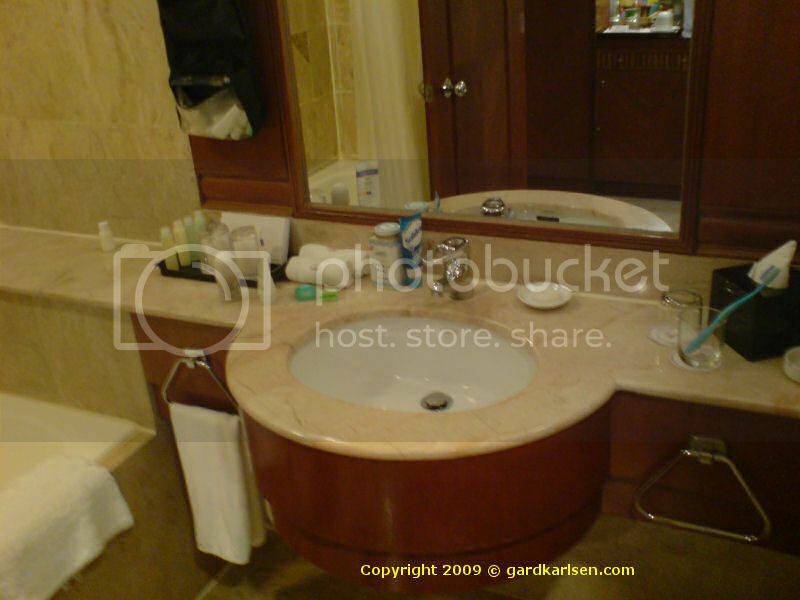 The bathroom was in old fashion style but did contain quite a lot of amenities. But there was one major “flaw” in my opinion: the shower. You have to take a shower in the bathtub and there is a shower curtain that prevents the water from flooding. But even if I did use the shower curtain right, the water were still leaking on to the floor. The shower head was also too low so I had to bend down to wash my hair…and I’m average in height. In the hall outside my room music were played constantly and the volume was so loud that I woke up in the middle of the night hearing the music. It was pretty bizarre waking up to Hall of the Mountain King by Edvard Grieg for Henrik Ibsen’s play Peer Gynt. The club level lounge did offer evening cocktails and breakfast and the food and drinks were quite good. The lounge had a view to the Petronas twin towers and the location of the hotel is not bad on Jalan Ampang, right next to Bukit Nanas monorail station. I don’t think it took more than 10 minutes to walk to KLCC. The pool was pretty big and it looked ideal if you are bringing your kids. As you can understand from my review, I was not very impressed with the hotel. What bugged me the most was the lack of internet…well, you could of course buy access but we were already paying 540 Ringgits per night. The fact that the room was not very attractive did not help either and the music in the hall was annoying me. So in the end we did something that I have never done before…we started checking out other hotels. After two days we called Traders and we were more than thrilled to hear that they had rooms vacant. 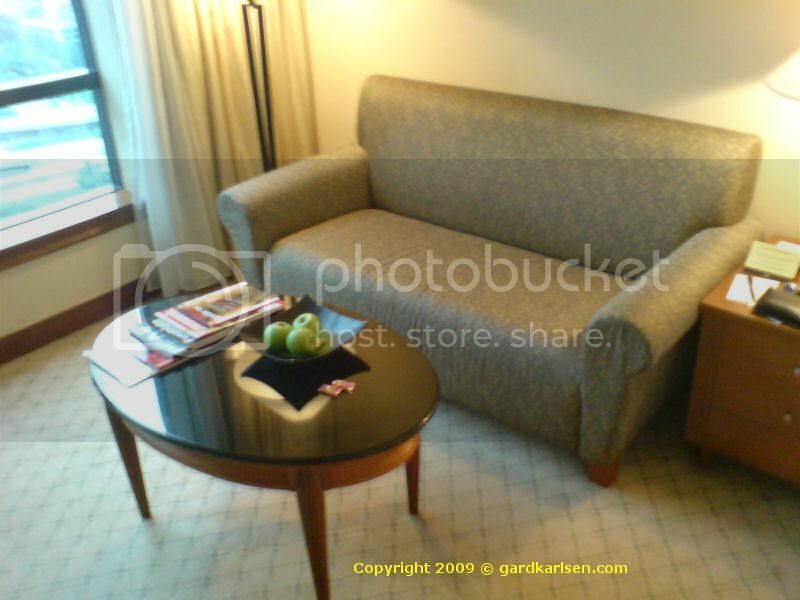 So we checked out of Renaissance and into Traders…not only did we get a nice modern room, free internet, closer location to the Petronas twin tower…we also got it about 100 Ringgit cheaper.